Disney 'toons? Always almost as good on video. No worries. Spade's whiny wisecracks ideal for spoiled emperor turned into beast of burden in Disney's "New Groove"
How does Disney do it? How does the studio keep cranking out these cartoons that are so wildly entertaining and seemingly fresh even though it uses the same ingredients year after year? "The Emperor's New Groove" has all the off-the-shelf elements of your standard Disney 'toon: Beady-eyed baddie? Check! Incompetent henchman? Check. Historical locale and/or exotic cultural setting? Check. Wisecracking animal sidekick? Check. Doofus male lead? Check. Yet here I am again, absolutely loving this latest assembly line production because it's sprightly, clever and fun, fun, fun. David Spade, whose snide and whiny routine usually annoys me no end, is perfectly cast as the voice of Kuzco, the spoiled brat monarch of an ancient Peruvian empire. Showing off how the whole world revolves around him, in the opening scene he looks into the audience and says "Watch this!" "Butler!" he hollers, and instantly a (ancient Peruvian) butler comes running. "Cook!" he shouts, and a feast appears before him. "Theme song guy!" There's an animated version of Tom Jones, belting out a show tune (one of just two musical number in the movie). Snotty egoist that he is, Kuzco isn't evil. He just has some lessons to learn -- he's a Disney cartoon hero after all. But his nefarious court magician is evil -- and arguably one of the great Disney villains. Her name is Yzma, she has that sucked-dry skin-and-bones look of a age-ravaged fashion maven (think Helen Gurley Brown crossed with Cruella DeVil) and the how-apropos voice of Eartha Kitt. Yzma tries to kill Kuzco with poisoned wine so she can usurp his throne. But her bumbling, broad-shouldered, lantern-jawed lackey Kronk (Patrick Warburton -- Puddy on "Siendfeld" -- another stroke of genius voice casting) mixed up the poison with a potion that turns the emperor into a llama instead. Trying to dispose of the evidence, Kronk dumps the animal outside the city, where llama Kuzco, very busy feeling sorry for himself, meets up with a peasant named Pacha (John Goodman) whose village the emperor was going to level to build himself a summer home. Reluctantly Pacha agrees to help Kuzco get his throne back as long he doesn't destroy the village -- a promise Kuzco makes and breaks more than once in their adventurous journey back to the city. What sets "New Groove" apart from other recent Disney cartoons is its hilariously self-aware sense of humor. Kuzco narrates the film himself in an attempt to persuade the audience he's just a misunderstood nice guy who did nothing to deserve this four-legged fate. When the story focuses in on Pacha, he freeze-frames the picture, reminding the audience "this movie is about me!" while scratching his companion out of the frame with a red marker. This kind of comedy runs throughout the movie, as do Spade's sometimes droll, sometimes bleating ad-libs that make Kuzco feel even more like the sarcastic but pampered teenager that he is. The animation is as seamless as we've come to expect from Disney, and Kuzco's llama face is so fantastically expressive that several good laughs come just from his blubbery mugging. 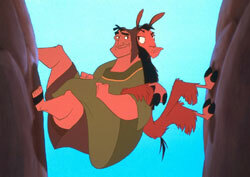 "The Emperor's New Groove" has a few minor shortcomings. Spade's dialogue ("gettin' down with my bad self!") will date the movie badly in years to come and the setting of aboriginal Peru seems almost random -- no attempt is made to enfold the culture into the story, as was done with "Mulan's" ancient China backdrop. But while "New Groove" may not be a timeless animated masterpiece like "Beauty and the Beast," even with its recycled elements and its oh-so-Y2K airs, it's definitely the funniest and most seat-bouncingly fun of any animated feature since Disney revived the medium with "The Little Mermaid."